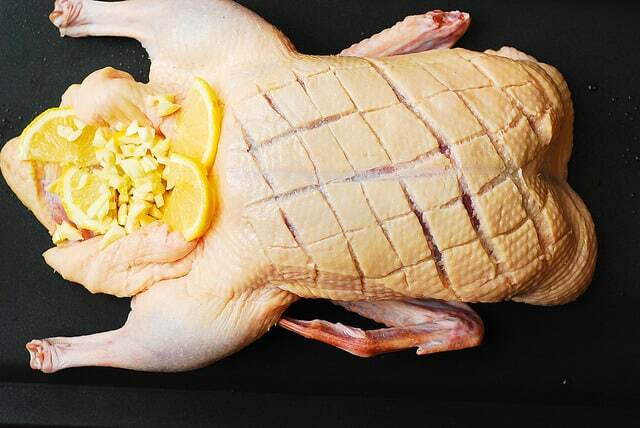 Ever wondered how to cook duck? It’s much simpler than most people think. 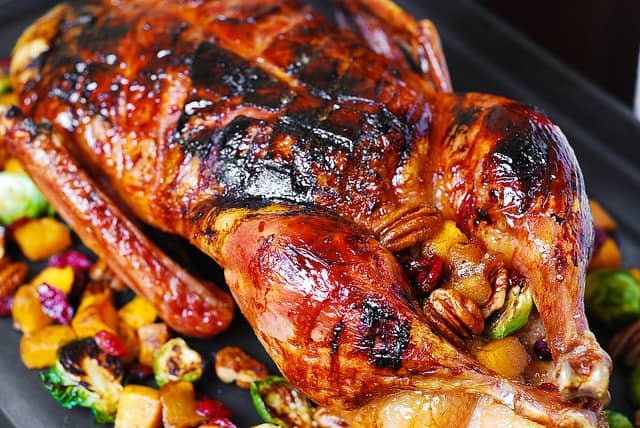 This Roast Duck has tender and juicy meat, crispy skin, and it’s glazed with the honey-balsamic glaze to give the duck a beautiful roasted look. Perfect holiday main dish recipe or something you can make any time for a special occasion. 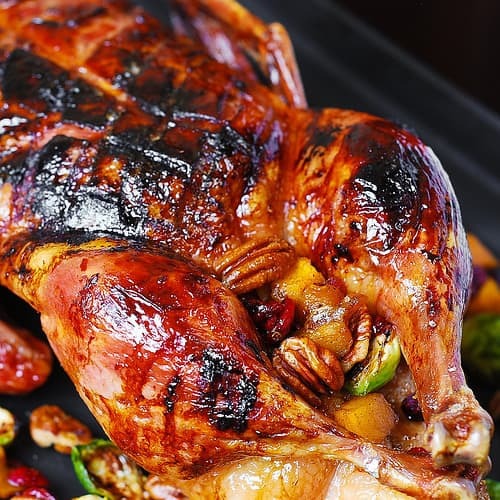 It’s a great looking dish – perfect for any special occasion, and with the holidays coming up, this roast duck will look great on any Thanksgiving dinner menu, or as a Christmas and New Year’s Eve dinner idea. By the way, the honey-balsamic glaze in this recipe DOES NOT MAKE THE DUCK SWEET – I did not want a sweet duck. It only gives the nice crispiness and beautiful look to the duck skin. Your duck will have a very savory and juicy flavor from the garlic and lemon that you’ll stuff inside the duck cavity. SO GOOD! Cooking this duck does take some time and effort, which makes it a perfect holiday main dish or a special occasion dinner. This recipe has very detailed instructions (with step-by-step photos) on how to prepare and cook the duck – which could be very helpful if you’ve never cooked the duck before. The duck will be roasted in the oven at 350 F for a total of 3 hours, and in addition to the beautiful duck, you’ll end up with a lot of duck fat which I highly recommend you save and use for roasting vegetables, potatoes, and even cooking your breakfast eggs with it! Step-by-step photos and instructions start here (the complete recipe without photos is at the bottom of this post). I recommend that you read and look through these photos and then scroll down to the recipe box itself for more condensed version of the recipe (without photos). 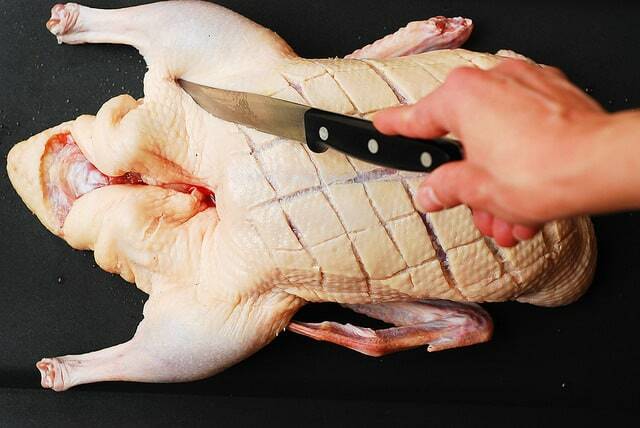 Poke the other fatty parts of the duck with the tip of the knife all over, to ensure fat release, especially in very fatty parts. 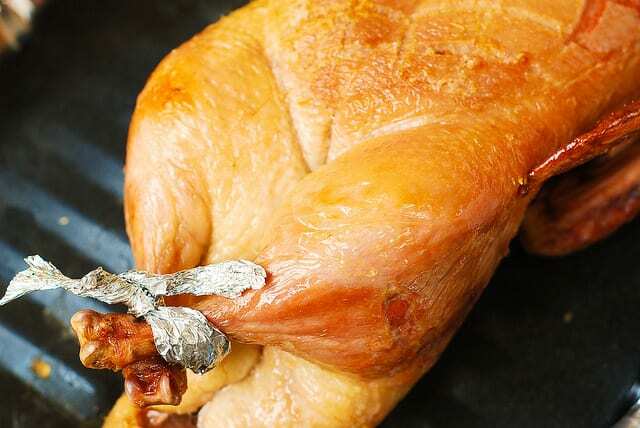 You don’t need to poke the duck legs as the skin is pretty thin there (except for where the duck legs connect to the duck body). 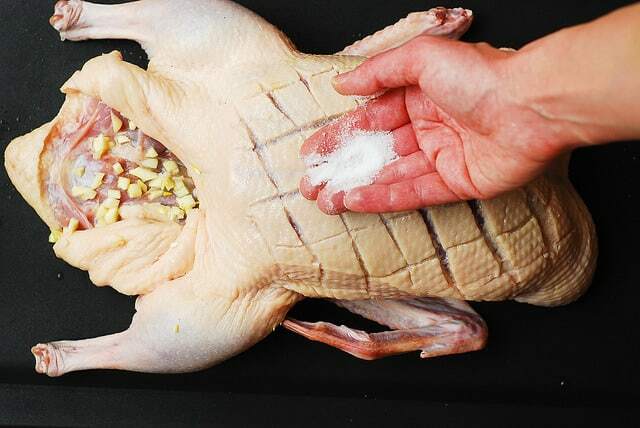 Season the duck very generously with salt both inside the cavity of the duck and outside on the skin, legs, all over. Put 5 chopped garlic cloves and lemon slices inside the duck cavity (these are just for flavor, not for eating – you will discard them after cooking). 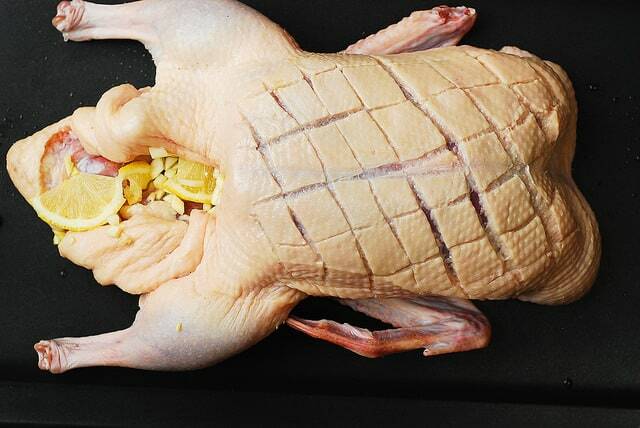 The duck will have flapping skin on both ends – fold that skin inwards, to hold the garlic and lemon inside. 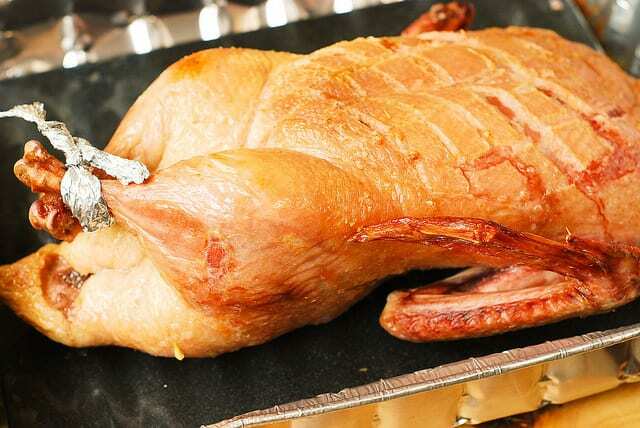 Place the bird breast side up on a large roasting pan with a rack (roasting pan should have a roasting rack to lift the duck from the bottom of the pan and allow the fat to drip below the duck). 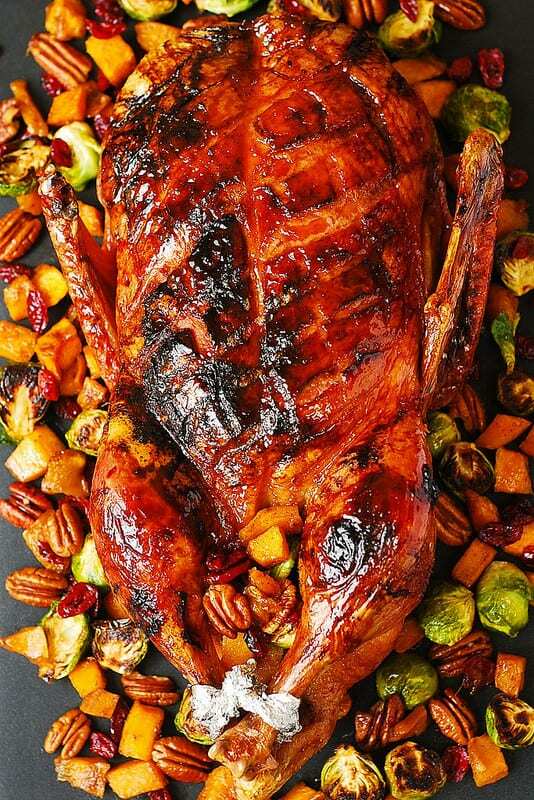 You will be roasting the duck for a total of 3 hours at 350 F. These 3 hours of roasting are divided into 4 distinctive time chunks (1 hour breast side up + 40 minutes breast side down + 40 minutes breast side up brushed with balsamic-lemon mixture + 40 minutes breast side up brushed with honey-balsamic mixture). 3. In a small bowl, combine 1/2 cup of balsamic vinegar with the freshly squeezed juice of 1 lemon. 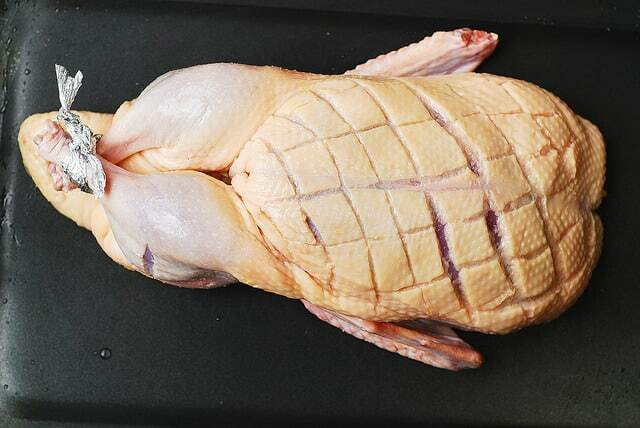 Set the duck breast side up again on the roasting rack in the roasting pan. Brush all of the duck with the balsamic mixture (especially the scored duck breast) and cook the duck breast side up for another 40 minutes at 350 F, brushing every 10 minutes with the mixture. 4. Now, in a separate small bowl, combine 1/4 cup honey and 3 tablespoons of balsamic vinegar lemon mixture that you will have left over from the previous step. Brush the breast side of the duck with this honey-balsamic mixture, and roast the duck breast side up for another 40 minutes, brushing the duck breast side every 10 minutes with honey balsamic mixture. You can even carefully broil the duck for the last 10-15 minutes if you like (do it carefully, checking the duck regularly to make sure it doesn’t char too much). 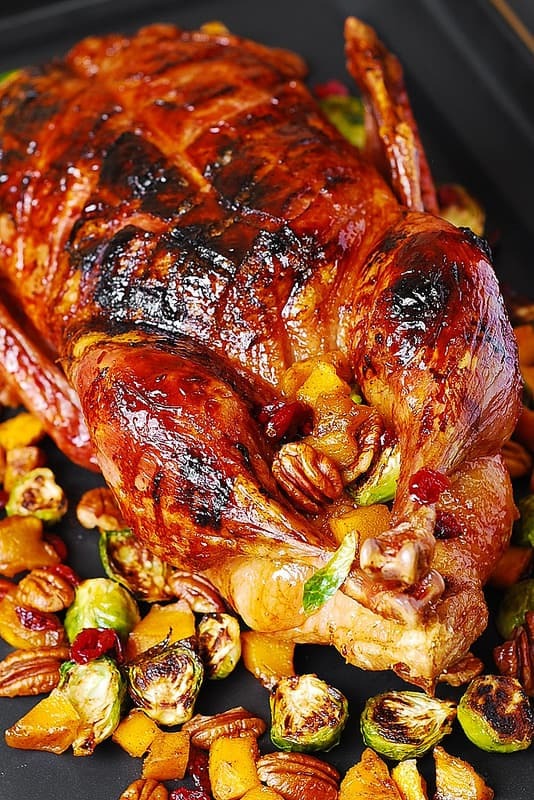 If you want a really beautiful and festive presentation for your holiday duck, use my recipe for Roasted Brussels Sprouts, Butternut Squash glazed with Cinnamon & Maple Syrup, with Pecans & Cranberries. 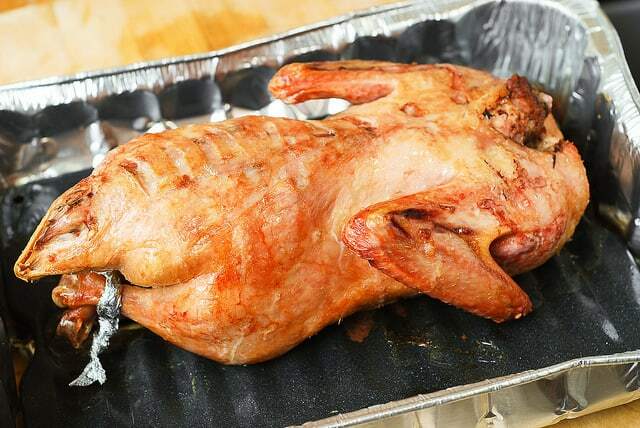 Detailed recipe with step-by-step photos on how to roast a whole duck in the oven. 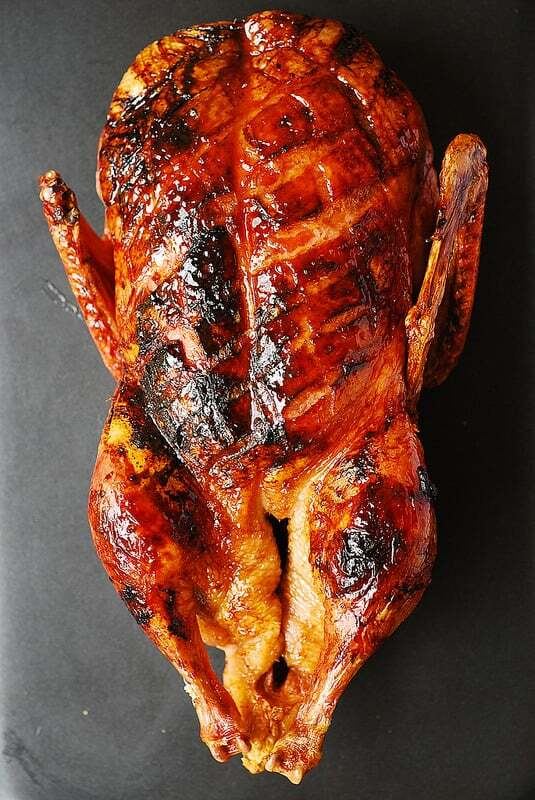 This Roast Duck has juicy meat, crispy skin, and it's glazed with the honey-balsamic glaze to give the duck a beautiful roasted look. Perfect main dish for any special occasion, especially holidays, such as Thanksgiving, Christmas, and New Year's Eve! 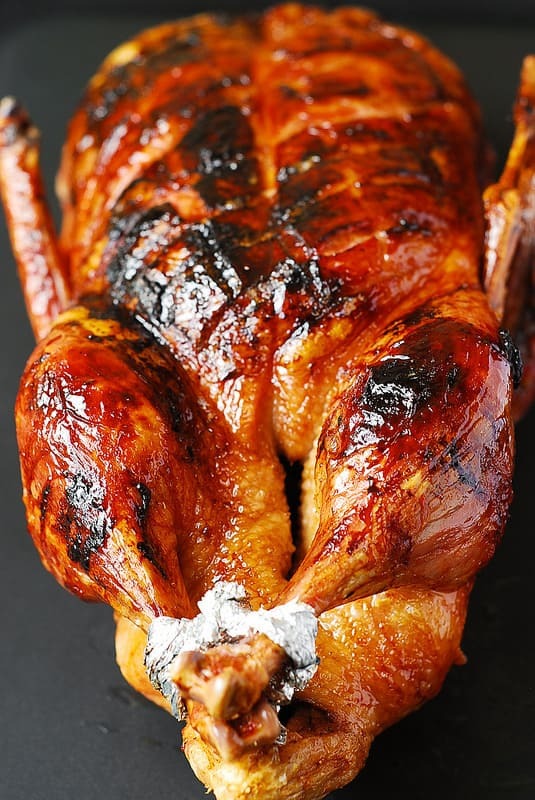 Preheat oven to 350 degrees F. You will be roasting the duck for a total of 3 hours (3 hours will be divided into 4 time chunks where you will be flipping the duck, brushing it with glaze, etc. - see the instructions below). Set the duck on the working surface. 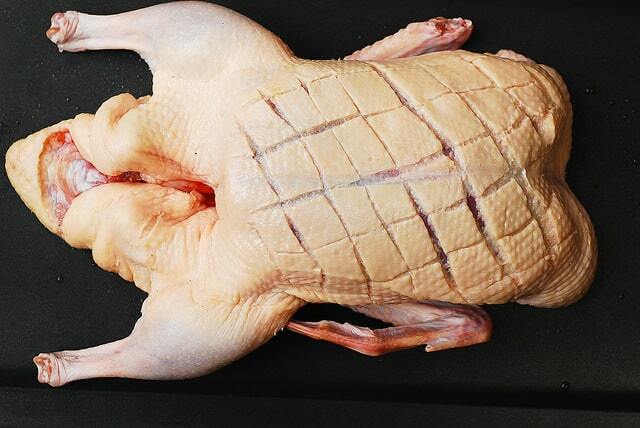 Score the duck's skin on the breast in a diamond pattern, making sure you only cut the skin, without reaching the meat. Poke the other fatty parts of the duck with the tip of the knife all over, to ensure fat release, especially in very fatty parts. 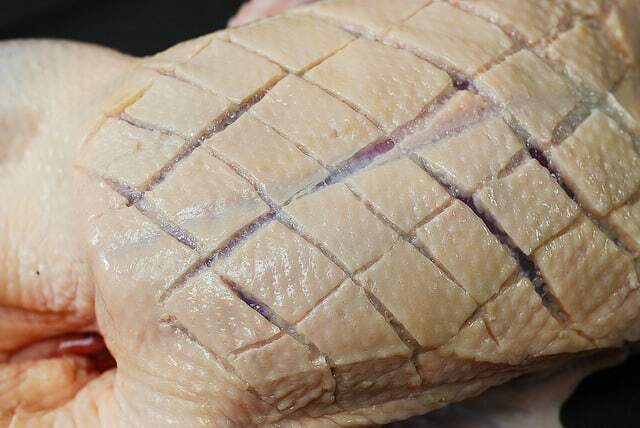 You don’t need to poke the duck legs as the skin is pretty thin there (except for where the duck legs connect to the duck body). Season the duck very generously with salt both inside the cavity of the duck and outside on the skin, legs, all over. Place the duck breast side up. Put 5 chopped garlic cloves and lemon slices inside the duck cavity (these are just for flavor, not for eating - you will discard them after cooking). The duck will have flapping skin on both ends - fold that skin inwards, to hold the garlic and lemon inside. 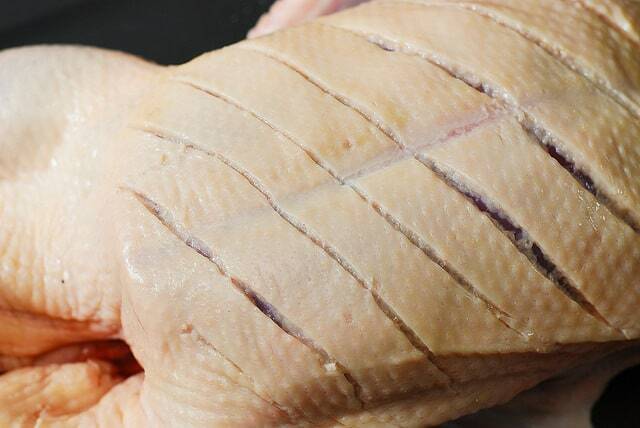 Tie up the duck legs with butcher's twine. Remove the roasting pan with the duck from the oven (you now have roasted the duck for 1 hour + 40 minutes), carefully remove the duck to a platter (making sure the lemons and garlic from the cavity do not fall out - keep the skin on both ends of the duck folded), and carefully pour off all the duck fat juices from the roasting pan into a large heat-proof bowl or container. Now, in a separate small bowl, combine 1/4 cup honey and 3 tablespoons of balsamic vinegar lemon mixture that you will have left over from the previous step. 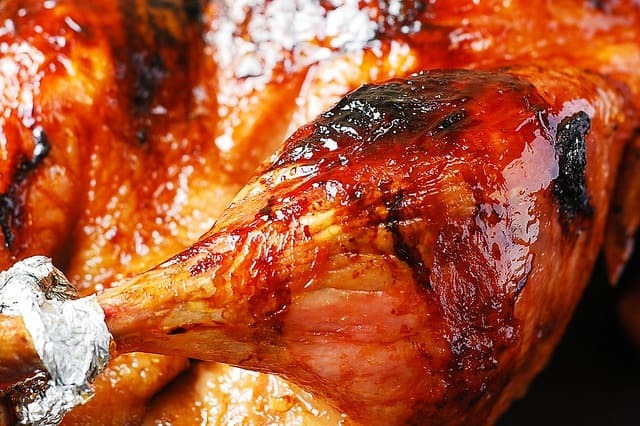 Brush the breast side of the duck with this honey-balsamic mixture, and roast for another 40 minutes, brushing the duck breast side every 10 minutes with honey balsamic mixture. You can even carefully broil the duck for the last 10-15 minutes if you like (do it carefully, checking the duck regularly to make sure it doesn't char too much). 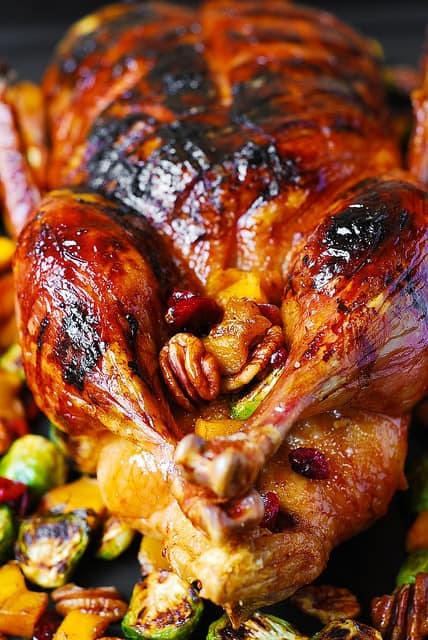 Need a beautiful side dish to go with your roast duck? This is the best recipe and cooking method for duck I’ve found in 50 years! 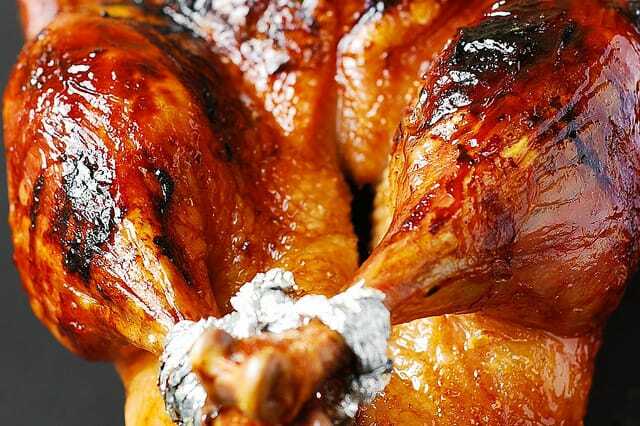 Mine was much smaller, so I did the first two turns, then mixed the sauce and honey and basted until finished. When it was at temp, I turned the oven off and let it sit while I got the rest of the meal done, about half hour. It was the most juicy, tender duck I’ve cooked to date, and the rest of the sauce and a bit of the duck fat made a great sauce for steamed veggies!!! This looks so good I’m going to try it this afternoon. The only thing I have a question about is, is it covered at any time. I’m assuming not, since it’s not in the recipe. I followed your recipe, but I used a thin duck grown at home, it’s nice because it wasn’t fat :). So the advantage is that the cooking time was reduced due to it hadn’t fat and roasted with 1:40m. The balsamic and lemon juice I added before just to complete your recipe because if I kept the whole process the meat would be dried. The taste was wonderful, the next time I will buy a duck in the supermarket that used to come from the farms, it certainly will be little bit fat lol. Hi, I’m yet to make this but wanted to know how the cooking time would vary for a 4.6lbs (2.1kgs) duck? Excellent, easy. Crunchy! I made an adjustment. Filled cavity with lemons only. And basted with balsamic and orange marmalade that had pieces of rinds. Feel the flavor? Some fruity sweetnes, rich notes from the rind, lemony, yum!!! Simply an excellent recipe and your detailed instructions were a big help for a first-timer! BRAVO! !